Japan is a wonderful country with fascinating culture and history, where you can see works of art and monuments at practically every corner, if you know where to look. 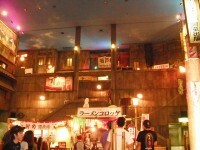 It’s not difficult to single out the most popular attractions in Japan, although there are many of them. But if you’ve had your fill of exquisite temples, glamorous shopping centers, parks and nature, then maybe it’s time to look at another side of Japan – one that is funny, irreverent and not afraid to step into bizarre territory. If you like unique and unmatched attractions, then look no further, because we’ve compiled a list of the weirdest attractions in Japan, which should absolutely be on the to-see list of any traveler who likes fun. This whimsically titled memorial is far more serious and touching than it might sound at first. The memorial is dedicated to the crew of the Lucky Dragon tuna fishing ship, who died when waste from a little-known American nuclear experiment fell onboard and on the catch. The sailors died and the tuna catch became nuclear waste. The museum dedicated to the tragedy has a separate chamber commemorating the ship’s cargo: 450 tons of tuna fish, which sadly had to be dumped. Starving students and impoverished travelers alike have feasted on the contents of instant ramen bowls. But while ramen conjures up unpleasant memories for some Westerners, in Japan a bowl of hot ramen soup is the meal of choice for millions of people. Ramen is so beloved in Japan that there is a museum dedicated to it – to all kinds of instant ramen packets, ramen making utensils, ramen history. A visit to the gift shop, where ramen packets and ramen bowls are sold is mandatory. Yoyogi Park, a huge Tokyo park next to Harajuku Station, becomes a completely different world on Sundays. If you want to see fashion like you’ve never seen before, and young people unfettered from the shackles of conventionality, then an afternoon stroll in Yoyogi on Sunday should not be missed. The hip alternative crowd of Tokyoite congregate in the park, displaying crazy costumes, cosplay, edgy fashion. Photos are encouraged and fashion tips are given on request. If you like scary Japanese folk tales, the you will love a visit to the mystical Aokigahara forest at the base of Mount Fuji. The many caverns hidden in the forest are quite popular with tourists, but there are legends about them – they are the homes of various mythical beings, not all of which are friendly. 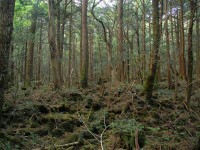 On a more realistic note, Aokigahara is a popular place for…suicides. Almost a hundred people ended their lives in the forest, and now there are signs in English and Japanese, begging people to think twice before offing themselves – if that’s not one of the weirdest attractions in Japan, nothing is. Fishers are people who catch fish with nets of fishing poles, right? Well, traditional Japanese fishing involves training a bird to do the work for you. Ukai, an old fishing method, has only a few practitioners left, and even those must have proper training and authorization. Ukai involves the training of cormorants to catch the fish and bring it to the fisher. 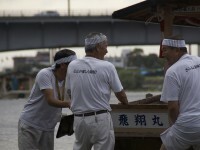 You can see treams of ukai fishermen do their job on the Katsura River in Kyoto.